Living… in an era of inter-stellar exploration, where the survival of human civilization on Earth is no certain thing. Fifty years ago, the army of the bug-like Formic aliens attacked Earth and were only narrowly defeated. Graff’s duty is to help the International Fleet prepare for a second war with the Formics, one that will hopefully end with total annihilation of the Formics. For Graff, their very existence is a threat. Interests… discussing Ender with his colleague, Major Anderson. Graff judges Ender by a much higher standard than his peers and subjects him to increasingly greater pressure and difficult challenges, almost as if experimenting on a rat, to see how far he can push him. 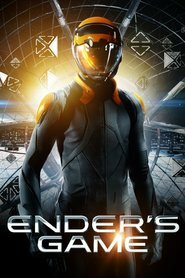 He blocks Ender’s correspondence with his family; he tests how Ender handles rejection; he tells Ender, “The fleet owns you.” Graff is convinced that Ender may be humanity’s best chance to defeat the Formics, so he is determined to make him the best he can be, by any means necessary. Relationship Status… married to his job. It seems that Graff’s main relationship is to the Formics, whom he wants to destroy. He doesn’t appear to have the luxury of a personal life. He does care about Ender, but it’s not clear how much of that is due to a genuine affection for Ender compared to Graff’s overriding interest in the future of mankind – as he sees it, anyway. Challenge… winning the imminent war against the Formics. As Major Anderson points out, Graff doesn’t see the Battle School cadets as children, but more like thoroughbred horses. For Graff, victory is all that matters. For Ender, the means of victory matters just as much as victory itself. Personality… intensely serious. Though he indeed views the cadets as horses to be trained, he is not necessarily a bad person; it is more that his job is of such seriousness that moral quandaries cannot always be properly mulled over. Perhaps once he was less rigid. But then again, perhaps not. Colonel Graff's popularity ranking on CharacTour is #2359 out of 5,000+ characters. See our top-ranked characters and read their profiles.